Sponsored by Down & Dirty by Rhenna Morgan. Available now! The 16th century was a thrilling time for books, at least for those who could afford them: building a respectable personal library (even if it didn’t include novelties like the books that open six different ways and the wheels that made it possible to rotate through many open books at once) took serious resources. Hernando Colón, the illegitimate son of Christopher Columbus, seems to have commanded such resources: as The Guardian’s Alison Flood writes, he “made it his life’s work to create the biggest library the world had ever known in the early part of the 16th century. Running to around 15,000 volumes, the library was put together during Colón’s extensive travels” and ultimately contained everything from the works of Plato to posters pulled from tavern walls. All these books sounds amazing—and sí, more bilingual books por favor. Yeah, so September can’t come fast enough. Looking to create an ambiance where people, cultures, and books from around the world could mingle, a literary theme runs throughout the interior. Visitors are instantly brought into the concept as they are welcomed by a 33-foot-tall bookcase just inside the entryway—a bold statement that immediately establishes the function of the building. This is carried through to the delightful lighting above the open spiral staircase, which mimics floating pieces of paper just waiting to be filled with words. My heart soared just looking at the images! What a dreamy bookstore. Earlier this month, children’s author Lee Wardlaw drove a trailer loaded with more than 5,300 books from Santa Barbara to Paradise, Calif., delivering 1.5 tons of literary donations from more than 240 authors, readers, librarians, and publishing professionals. Last November, the Camp Fire—the most destructive wildfire in California’s history—destroyed 90% of this town. The fire burned through more than 153,000 acres, killing 85 civilians, and injuring three firefighters; nearly 14,000 residences were destroyed along with thousands of other structures. The first new Brooklyn Public Library branch in more than a generation is going up in DUMBO. Dubbed the Adams Street Library, the branch was negotiated by Councilmember Stephen Levin as one of several sweeteners in the deal to sell the Brooklyn Heights branch for development. The library is slated to open in 2020. Library openings are such great news. So many books just went onto my TBR. 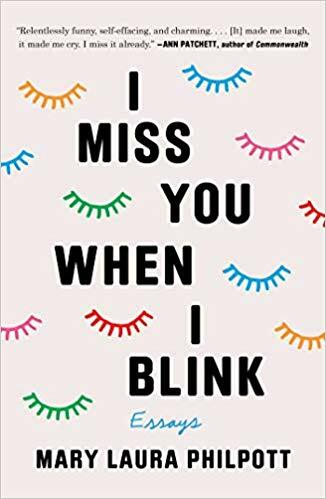 Sponsored by I Miss You When I Blink by Mary Laura Philpott. Some of my favorite literary stories are about the discovery of lost work. Two of your YA faves are teaming up. EW can exclusively announce that Becky Albertalli (Simon vs. the Homo Sapiens Agenda, the basis for Love, Simon) has partnered up with Aisha Saeed (Amal Unbound) for a novel to publish early next year: Yes No Maybe So. Yet another great-sounding YA book about politics coming next year. Every blank wall, a bookshelf mural. This is cool! Ambitious doesn’t begin to describe Carla Hayden’s plan to make the Library of Congress’ collection available to the world. Audacious may be closer to it. Hayden, the 14th person to steward the Library, wants to “throw open the treasure chest” by digitizing its vast collection and making it accessible online. The five-year plan’s understated name — Enriching the Library Experience — doesn’t capture its scope. Hayden wants people to engage with everything from the letters of Abraham Lincoln to early-edition Batman comics.